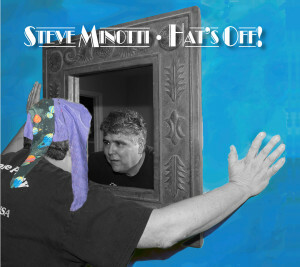 I just released my 2nd full length CD Hat’s OFF! and selling music is not an easy task these days but I’m up for the challenge !!! It’s a collection of songs from over the many years of my life as well my experiences in the music business. They are the songs I’ve written with my heart on my sleeve. The CD is a road map to the events of love , heartache, and both the good and bad decisions in my life. I’ve never been any good at writing songs that don’t have meaning or purpose. So what you get in one of my records is me…pure and simple. I like to get right to the point in my songs and I want to convey my message with as few words as possible!! Writing ballads is my forte; it’s what I grew up listening to on the radio in the 60’s and 70. Joni Mitchell, Jackson Browne, Cat Stevens, James Taylor, Neil Young, and Tom Petty are just some of my influences and I have covered their songs over my career. Tonight, I am excited to tell you that my new CD, “Hat’s Off!” is now on sale at cdbaby.com. Just click on the link above to purchase my CD. It makes an awesome stocking stuffer just in time for Christmas!!! Welcome to my brand new, spanking website along with my attempts at blogging!